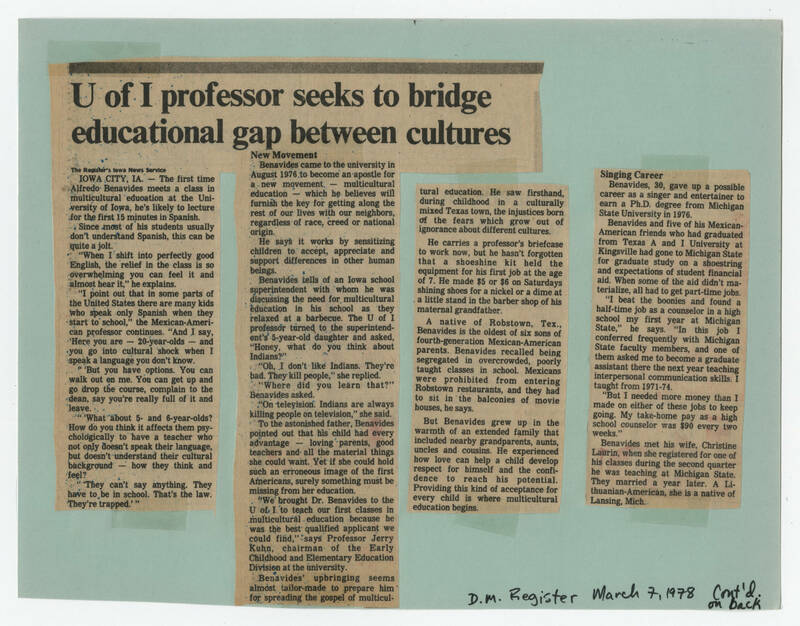 [[Header]] U of I professor seeks to bridge educational gap between cultures [[end header]] [[bold]] The Register's Iowa News Service [[end bold]] [[Article text]] IOWA CITY, IA -- The first time Alfredo Benavides meets a class in multicultural education at the University of Iowa he's likely to lecture for the first 15 minutes in Spanish, this can be quite a jolt. "When I shift into perfectly good English, the relief in the class is so overwhelming you can feel it and almost hear it," he explains. "I point out that in some parts of the United States there are many kids who speak only Spanish when they start to school," the Mexican-American professor continues. "And I say, 'Here you are -- 20-year-olds -- and you go into cultural shock when I speak a language you don't know. " 'But you have options. You can walk out on me. you can get up and go drop the course, complain to the dean, say you're really full of it and leave. " 'What about 5- and 6-year-olds? How do you think it affects them psychologically to have a teacher who not only doesn't speak their language, but doesn't understand their cultural background -- how they think and feel? " 'They can't say anything. They have to be in school. That's the law. They're trapped.' " [[Bold subheading]] New Movement [[end bold subheading]] Benavides came to the university in August 1976 to become an apostle for a new movement -- multicultural education -- which he believes will furnish the key for getting along the rest of our lives with our neighbors, regardless of race, creed or national origin. he says it works by sensitizing children to accept, appreciate and support difference in other human beings. Benavides tells of an Iowa school superintendent with whom he was discussing the need for multicultural education in his school as they relaxed at a barbecue. The U of I professor turned to the superintendent's 5-year-old daughter and asked, "Honey, what do you think about Indians?" "Oh, I don't like Indians. They're bad. They kill people," she replied. "Where did you learn that?" Benavides asked. "On television. Indians are always killing people on television," she said. To the astonished father, Benavides pointed out that his child had every advantage -- loving parents, good teachers and all the material things she could want. yet if she could hold such an erroneous image of the first Americans, surely something must be missing from her education. "We brought Dr. Benavides to the U of I to teach our first classes in multicultural education because he was the best qualified applicant we could find," says Professor Jerry Kuhn, chairman of the Early Childhood and Elementary Education Division at the university. Benavides' upbringing seems almost tailor-made to prepare him for spreading the gospel of multicultural education. He saw firsthand, during childhood in a culturally mixed Texas town, the injustices born of the fears which grow out of ignorance about different cultures. he carries a professor's briefcase to work now, but he hasn't forgotten that a shoeshine kit held the equipment for his first job at the age of 7. He made $5 or $6 on Saturdays shining shoes for a nickel or a dime at a little stand in the barber shop of his maternal grandfather. A native of Robstown, Tex., Benavides is the oldest of six sons of fourth-generation Mexican-American parents. Benavides recalled being segregated in overcrowded, poorly taught classes in school. Mexicans were prohibited from entering Robstown restaurants, and they had to sit in the balconies of movie houses, he says. But Benavides grew up in the warmth of an extended family that included nearby grandparents, aunts, uncles and cousins. He experienced how love can help a child develop respect for himself and the confidence to reach his potential. Providing this kind of acceptance for every child is where multicultural education begins. [[Bold subheading]] Singing Career [[end bold subheading]] Benavides, 30, gave up a possible career as a singer and entertainer to earn a Ph.D. degree from Michigan State University in 1976. Benavides and five of his Mexican-American friends who had graduated from Texas A and I University at Kingsville had gone to Michigan State for graduate study on a shoestring and expectations of student financial aid. When some of the aid didn't materialize, all had to get part-time jobs. "I beat the boonies and found a half-time job as a counselor in a high school my first year at Michigan State," he says. 'in this job I conferred frequently with Michigan State faculty members, and one of them asked me to become a graduate assistant there next year teaching interpersonal communication skills. I taught from 1971-74. "But I needed more money than I made on either of these jobs to keep going. My take-home pay as a high school counselor was $90 every two weeks." Benavides met his wife, Christine Laurin, when she registered for one of his classes during the second quarter he was teaching at Michigan State. They married a year later. A Lithuanian-American, she is a native of Lansing, Mich.